Blotchy pigmentation due to sun damage or pregnancy can damage an attractive look. This patient scheduled a skin care consultation at our offices to find out more about her options to correct the wrinkles and blotchy pigmentation near her eyes. She had oily skin, but no problems with acne that might need to be addressed beforehand. Mainly, she wanted to learn more about her options for pigmentation correction and spider vein removal in St. Louis. To start off, our medical aesthetician performed a VISIA™ skin analysis to asses the extent of damage to her skin. After seeing her VISIA results and discussing her options, the patient decided to start on the Obagi Nu-Derm Skin Care Program. This physician-strength skin care program helps encourage skin to revive itself, and can complement the effects of other noninvasive skin rejuvenation treatments. To clear up the brown pigmentation and some of the spider veins, the patient's face was also treated with Intense Pulsed Light therapy. The patient was pleased with her results. You can see in her photographs that the treatment very effectively eliminated pigmentation, while at the same time improving skin texture. 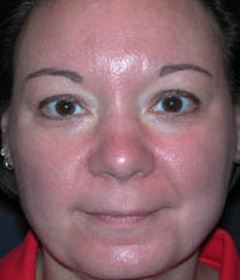 She underwent a second VISIA analysis after her treatments, which showed definite improvement in her skin quality. 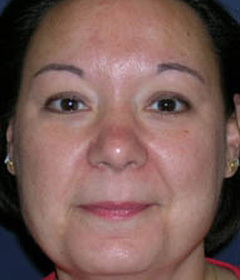 As a result of her St. Louis skin care treatments, her healthier skin also seems to be helping to minimize the appearance of her nasolabial folds.